Before mobile apps made their way into the palm of your hand, and your everyday life, there was healthy skepticism that apps would ever be mainstream solutions to aid people in everything from business to gaming. Years later here we are, coming out of the “app for that” era, and it’s nearly impossible to imagine life without them. It seems obvious but it’s important to think about how quickly apps ascended and integrated into the enterprise and consumer landscape, especially when we’re on the forefront of new technology. Apply this same principle to chatbots. You might share that same “app-like” skepticism about this statement, but Gartner doesn’t. And from our experience working with some of the world’s largest enterprises on building chatbots, neither do we. 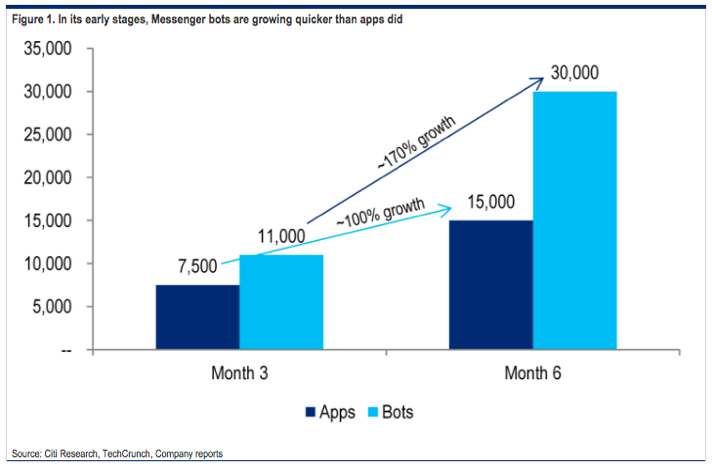 You may be thinking, “2020 isn’t that far away,” but here’s a hard hitter from Bloomberg: “bots have significantly outpaced apps in growth rate.” Since 2016, the bot chatter has taken off. On the other hand, if you’re thinking “I’ve already interacted with bots, and I’m not impressed,” the answer to that is simple as well: there are bots, and then there are AI-charged, enterprise-grade bots. When a light on the dashboard appears and you don’t know why, what’s the easiest way to find answers? One of the largest automotive companies in the world wants it to be their car manual chatbot. The way it works is, once a customer purchases a new car, the bot will contact them through text message, email, or any other communication method they prefer. The bot will introduce itself, list its tasks (anything from helping to set up the stereo to when to expect your first oil change,) and act as an at-the-ready guide for real-time questions. The bot can even offer to set up a service appointment or provide directions to the nearest dealership. One customer came to us aiming to create a “smart city.” For example, when a street light goes out, typically either a civilian or a city employee has to report the outage, making for a lengthy repair process. By adding sensors to the street lights that would communicate with the chatbot, notifications can be sent to the back-end system, triggering the repair process and scheduling, and even acting as a virtual assistant out in the field. Nobody likes filing taxes, but one of a bot’s most useful attributes is its ability to completely automate a tedious process. The totally digital experiences customers have come to expect from online tax services can still be impersonal and hard to follow. 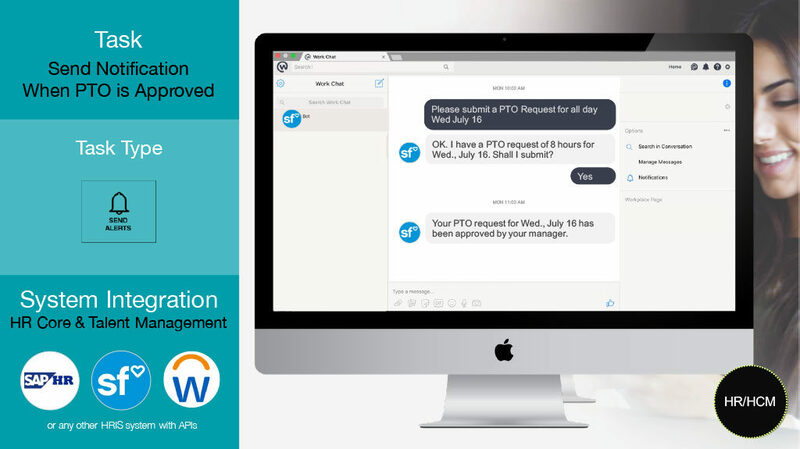 But what if you could add a conversational assistant to help them file without having to hire an accountant? One of the biggest tax filing companies out there has decided a chatbot is the solution. Think of it as their personal CPA. They can ask questions (i.e. what the heck does line xyz mean?) or get step-by-step guidance for complex filings. Onboarding: Benefits enrollment, 401k set-up, direct deposit, etc. Program promotion: Health program incentives, reminders, etc. Employee offboarding: Common tax/earnings questions, exit interviews, etc. An engineering giant came to us with a need for a solution to aid its technicians out in the field. These individuals are often unable to access their devices due to precarious work situations. The solution is two-fold: provide a hands-free device (in this case, smart industrial eyewear) paired with a chatbot that can communicate with back-end systems to facilitate any number of engagements: from signaling the need for equipment repair, to routine inspections, or even taking pictures of what they’re working on and submitting to the bot to get step-by-step assistance. The bottom line is, chatbots automate tasks, whether simple or complex. What’s important is that enterprises develop bots using a platform that is capable of developing both. With a truly enterprise-grade chatbots development platform, the possibilities of what a bot can do are endless, and more capable of handling complex tasks than you may have thought. And before you know it, just like that, you’ll forget bots were ever a revolutionary technology; they’ll just be part of your everyday life.